Wild bird identification is an ongoing process. Unfortunately, the birds don't read the books. If a book says this species has x color wash to its back and is found in y habitat and does z behavior, it doesn't mean that it's always true. Just as people, birds may have different dialects depending on location. Instead of "How are you today? ", it may say, "How ya'll doing?" Same question, just different sounding. I've lived in the east and when I moved to the west, he first thing I noticed was how Yellow Warblers sounded differently from what I was used to hearing. Same species, same song, slightly different dialect. And it doesn't take large distances to change a bird's song. For example, it's been observed that the same species of birds will sometimes have a different dialects on each side of a mountain. Listen to the 2 samples of Yellow Warbler song. One was recorded in South Dakota, the other in Idaho. The songs are slightly different. So it's good to use more than just field marks or song for wild bird identification. Use a combination of characteristics to identify species. In fact, many times specific field marks are your last identification resource. What is that bird doing in this habitat, at this time of year, in that plumage, singing that song, flying like that, doing that behavior? In most instances you can recognize a good friend or family member from far away without ever seeing the details of their face. Why? It's because you know how they walk, they stand, their mannerisms, the kind of clothes they wear, etc. Get to know birds the same way. How can you ID this bird, which beginners often mistake for a Black-capped Chickadee? Without needing to know field marks, you can eliminate any kind of chickadee simply from behavior. Chickadees don't creep upside down along the trunk of a tree. Brown Creepers do, but they're brown with a longer tail and have a slender, decurved bill. 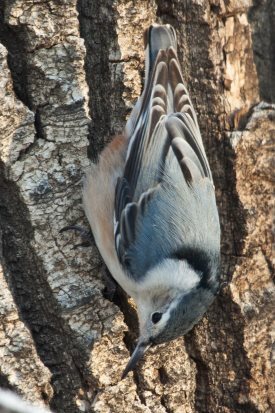 Now you can narrow it down to the nuthatches: White-breasted, Red-breasted, Brown-headed and Pygmy which can be further narrowed down by range, habitat, size, and finally field marks. Instead of focusing on fine details of birds, first look at general characteristics. Squint your eyes so that instead of focusing on details, you focus more on what the bird is doing, its size, shape, behavior, etc., instead of specific field marks. What would help you decide a bird is a sparrow or a warbler? A finch or a vireo? A thrush or a thrasher? Learn the family characteristics first before becoming overwhelmed by learning minute details of each species. This way when you spot a bird that you don't know, you will be able to narrow it down by type of bird or family, go to that section in your guide book and then narrow it down further to species. It's a lot easier when you know you need to go to the warbler section instead of looking at every little yellow colored bird in the book. A warbler. Now narrow it down further. A warbler with wingbars? Chestnut colors? Striping?...Much easier. Note: Get to know the morphology of a bird - its different parts and names. It will make it easier when describing characteristics to others and when searching for birds in your field guide. Is it bigger or smaller than a robin? Is is round and robust, short and stout, long and streamlined? Long, slender bill? Short, stout bill? Flattened bill? Decurved? Upturned? Hooked? Wide? Long? Short? Round wings? Streamlined wings? Accipiter-like or Falcon-like? Notched, rounded tail or squared tail? Flap, flap, glide; soaring, undulating flight, acrobatic? Wetlands, deciduous forest, high montane forest, spruce-fir forests, pinyon-juniper, sage, beach, savanna, pebbly streams, open country, farmlands, rocky cliffs, chaparral, etc. Does it have wing bars? Cap? Rump patch? Eyeline? Belly band? Barring? Streaks? Cheek patch? Eye ring? Geography and Time of Year? Although there is that occasional accidental straggler, most of the time you can eliminate some species by your location and the time of year. What is its breeding range? Winter range? Migration route? Is it spring, summer, fall, winter? Look at range maps. 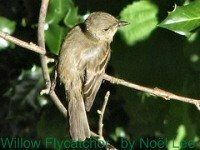 Is it possible for this bird to be here at this time of year? Field marks are not very helpful when identifying species of Empidonax Flycatchers. Empids (short nickname) are drab-colored birds with light to indistinct eye-rings and pale wing bars. In fact, when we band these birds, most of the time we must take specific measurements in order to determine species. Unfortunately, song doesn't help with ID since they don't sing while in the hand. So we measure the wing, tail, bill length, bill width and sometimes the gap between specific feathers to help us figure out the species. Needless to say, Empidonax Flycatchers are best separated and identified in the field by song, habitat, and manner of nesting. If you start to see the same species often, you will be able to notice subtleties of color that can help you ID them, otherwise it can be difficult for the first time identifying Empids in the field. 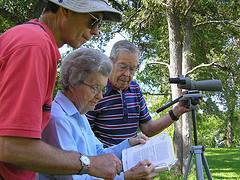 Wild bird identification, like anything else, takes practice. But don't get frustrated. It will become easier with each bird you identify. So go enjoy the outdoors and your very own Bird Watching Bliss!